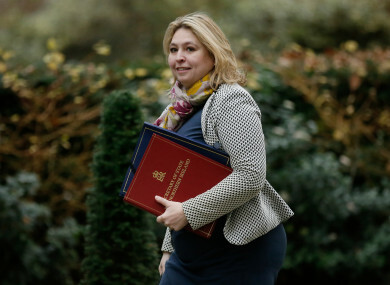 Northern Ireland secretary Karen Bradley said that killings by military and police forces during the Troubles “were not crimes”. TÁNAISTE AND MINISTER for Foreign Affairs Simon Coveney will meet with the Secretary of State for Northern Ireland Karen Bradley after she said that killings by military and police forces during the Troubles “were not crimes”. Coveney is to meet with Bradley in London this evening and will seek a clarification of the comments, which have been criticised by Sinn Féin as “outrageous and offensive”. In a statement released this evening, a spokesperson for Coveney said that the position of the Irish government “is clear”. There should be effective investigations into all deaths during the Troubles, regardless of the perpetrator. That is what is provided for in the legacy framework of the Stormont House Agreement and it is imperative we move forward with its implementation. There are no amnesties from prosecution provided for in the Good Friday Agreement or any subsequent agreements including the Stormont House Agreement. “The Irish government has been clear that it would not support any proposal to introduce such a measure, for state or non-state actors,” the statement added. During a House of Commons debate, the DUP MP Emma Little-Pengelly said that “well over 90% of the murders and injuries” caused during the Troubles in Northern Ireland were caused by acts of terrorism. Bradley agreed with those figures, which she said were “set out very powerfully”. Over 90% of killings during the Troubles were at the hands of terrorists. Every single one of those was a crime. The fewer than 10% that were at the hands of the military and police were not crimes. Later this afternoon, Bradley clarified her comments saying that she wasn’t referring to any specific cases, but was simply “expressing a general view”. The statement comes after media reports indicated that four ex-British soldiers could be charged with the 1972 shooting of unarmed marchers in Derry, known as Bloody Sunday. Former foreign secretary and Brexiteer Boris Johnson then wrote a lengthy opinion piece on the topic, where he claimed that there would be “a storm of utter fury” if the four men were charged next week. Are we really proposing to send old soldiers to die in jail – after we gave dozens of wanted terrorists a get-out-of-jail-free card under the Good Friday Agreement? Is that balanced? Is that fair? In 2010, the then-British Prime Minister David Cameron issued an apology to the people and families who suffered due to the Bloody Sunday killings. Sinn Féin deputy leader Michelle O’Neill said the comments were “outrageous and offensive”. These comments are an insult to families who have lost loved ones at the hands of the British army, state agencies and their proxies in the loyalist death squads which were directed by the British state. “Karen Bradley’s comments also show contempt for the legal system, including ongoing court cases into legacy cases involving the British state and its forces. She called for the comments to be withdrawn. SDLP Leader Colum Eastwood said the comments were “absolutely appalling”. Once again Karen Bradley has exhibited her stunning ignorance about the past. “Such comments, albeit always wrong, are particularly insensitive given the Bloody Sunday families await news on whether former British soldiers will be prosecuted for murdering 14 innocent civilians on the streets of Derry. He said that Bradley should apologise to families of state violence, “as well as setting aside time to read a book on the history of Ireland”. Email “Tánaiste to meet with Bradley tonight to seek clarification on police-killings comments”. Feedback on “Tánaiste to meet with Bradley tonight to seek clarification on police-killings comments”.